​Choose your own City Kid Birthday Party for your next birthday! 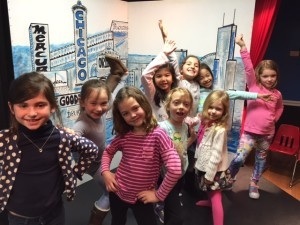 City Kid Theatre offers the best venue for Birthday Parties for kids of all ages! Activities: We will teach and perform improv games during the first 30 minutes of the party, break for a treat and return on the stage for 30 minutes of acting in our “made up” skits. The party will have access to our props such as many fun hats, glasses and light costume wear. At the hour mark the party will have the cake or cupcakes that are brought in. After this ceremony, we will return to the stage and practice our two favorite improv games and skits in preparation for the “final performance”. We will then use the final 15 minutes to break the party up in to teams and have fun improv competitions. Upon the last 15 minutes, we suggest that the parents arrive to pick up but stay for 10 minutes while the party performs a fun and adorable show for the crowd! The same as our “Karaoke Party” but with our very own videographer who will edit in camera and have an adorable music video as a great party favor that the entire party will take home and cherish forever starring the Birthday Boy or Girl and their favorite song and friends!